Hurricanes can have winds that can reach up to 180 mph, which can easily tear up a building. Storm surges cause most of the damage from hurricanes, and can reach up to 20’ in height. Wind damage is also a serious factor to consider because it can send objects flying, which, when they hit the building, can create large holes which can cause the collapse of the building. The pressure from the hurricane’s wind is mainly focused at the corners of a building, and the difference in pressure on different sides of a building can make the roof come off. Windows also need to have storm coverings so that debris cannot be blown through the window and create an opening in the building. 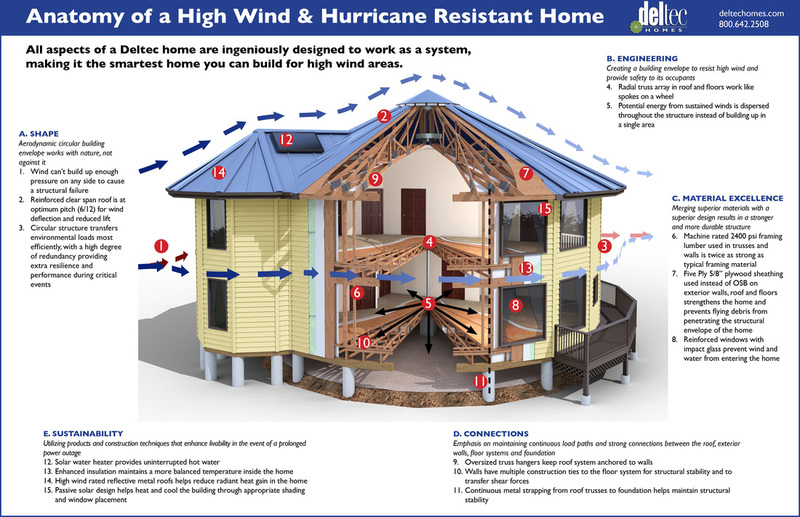 The catalyst for the destruction of a building from a hurricane is the entrance of the massively strong wind force that once inside, can easily tear off the roof and trash the building and make it very costly to replace. 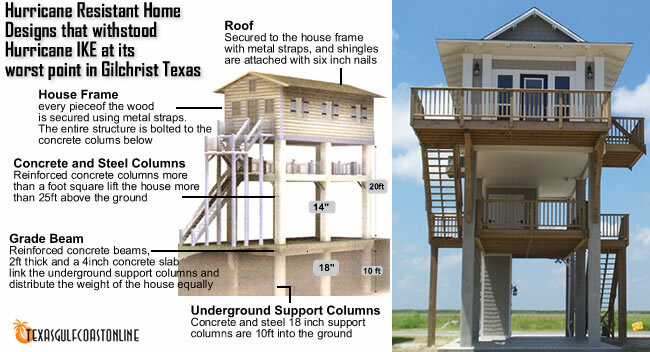 Materials that are used should be able to get wet because of the rainfall that happens when the hurricane makes landfall. The materials that help to make up the building should be able to dry easily after they get wet, and should be able to stand up to being wet. Steel supports are needed in the foundation to bolt the building to the ground. Steel is also needed to bolt the building together in order to keep it from being torn apart by the wind. Much of of the damage to buildings from Katrina was caused by the storm surge that caused many residents to have to escape to the roofs of nearby buildings. Because of how sudden and severe the storm surge was, many did not have enough supplies to sustain themselves, or any supplies at all. The buildings that they were having to rely on were compromised in regards to their structural integrity, and therefore were not completely safe. The fact that most of the buildings that were hit with flood damage were not prepared to deal with the heavy winds and storm surge is evident in the collapse of many buildings from having their supports weakened by the storm surge as well as the Hyatt Regency New Orleans which had beds torn out through the windows and insulation torn from the inside out. This widespread damage made nearly 300,000 buildings uninhabitable and caused billions of dollars of damage from the flooding alone. 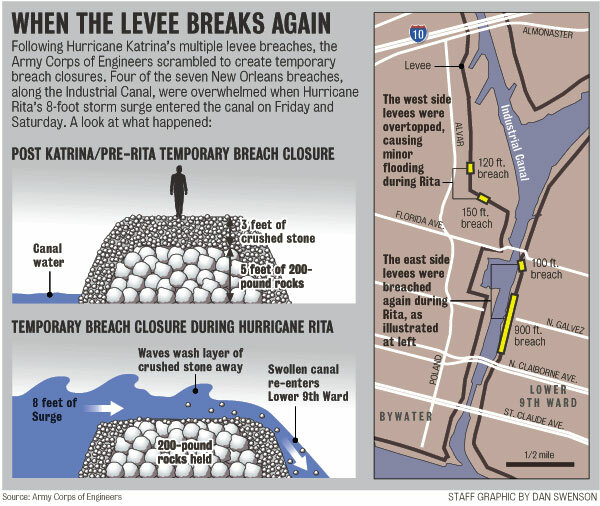 Much of the damage that Katrina caused to the city came from the water that was able to make it through the levees that broke. The main issue with Katrina was that it hit New Orleans, which is below sea level. This issue of elevation left New Orleans in a tricky situation where if there ever was a hurricane, the city would be at risk of being flooded. And rather unfortunately, these poor decisions factored greatly into just how badly Hurricane Katrina was able to dismantle the city of New Orleans.